The locks on the outside of your home are designed to protect you from the threats of the outside world. If they fail it may leave your home vulnerable to intruders and other unwanted guests. It is important to inspect your locks from time to time to ensure that they are in good condition and working properly. On a biannual basis check your home's locks for the following signs of lock failure. If you notice any of them get in touch with your local residential locksmith to have your home re-keyed and locked. If you insert and turn a key in the lock, the locking mechanism should remain still. If it seems to twist with the key or move in some other manner it indicates that the lock is not functioning properly and may not allow for the door to be snugly locked. While conducting your inspection try to swipe door locks with a credit card or some other piece of hard plastic. If the door pops open you'll want to upgrade the locks for better home protection. Any rust that can be seen on the exterior of the locks is a definite indicator they need to be repaired. Eventually the rust may cause the locks to break, which will make it very easy for someone to enter your home. Any damage to the lock will mean that it needs to be replaced. You may find dings and dents from moving heavy furniture or pitting, due to weather issues. These sorts of things may cause the locks to malfunction. If you can't slide your key into the lock with ease it may mean that some of the pins inside the lock are sticking. Alas, if the key is difficult to turn the lock is definitely showing signs of wear and tear. New locks will ease use and provide more adequate protection. It is important to keep your home and all that is inside it safe. If you need new home locks in Reno or Sparks, NV, reach out to Reno Sparks Lock & Glass. 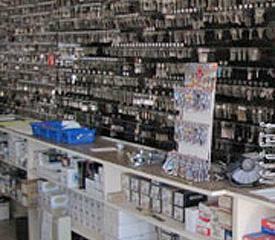 We offer complete commercial and residential locksmith services! Give us a call at (775) 525-5712 to learn more about our Reno locksmith business or to request a quote for service.